Posted on March 19, 2012 by The Baldock Bard. 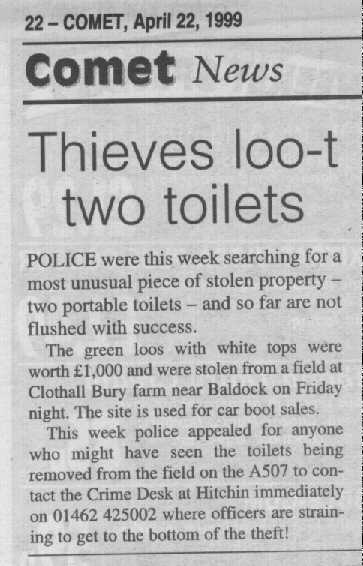 24th April 1999 – Arrived at the bootsale at 0530 only to find someone had stolen the portable toilets! After calling the police I dashed to fetch a spare. The policeman that arrived to look at the empty space was called PC Sweeny (Cockney rhyming slang ‘Sweeny’ or ‘Sweeny Todd’ = Flying Squad (at the time a division of the police). 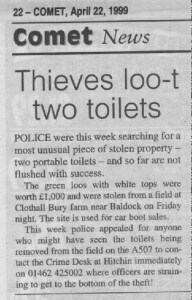 I have attached the local newspaper report which is, predictably, even more tongue-in-cheek than the verse! Police have nothing on which to go on! Posted on March 12, 2012 by The Baldock Bard. In all the years I have written verse for the Baldock Car Boot Sales, I have built up a ‘reject file’ of verse that was deemed not suitable for inclusion in the local paper adverts. It lay forgotten and gathering dust in the far recesses of my hard drive until a search revealed it, standing at the back frantically waving its hands in the air to attract my attention. As it had recently been granted legal aid! Posted on March 11, 2012 by The Baldock Bard. And money in the bank! 1998 was the year of a certain Monica Lewinski saga. Of course the Baldock Bard couldn’t let this one slip the net! She’d sold it in a boot sale instead! Posted on February 28, 2012 by The Baldock Bard. In 1997, the Baldock Bard (known then simply as ‘Stan’) wrote the first four verses for the Baldock Car Boot Sale adverts. Based on nursery rhymes they immediately gained recognition throughout nowhere and nobody commented on their humour, originality or content. The world turned, blissfully unaware that a revolution was happening that would leave nations untouched for many years to come. Now her bills don’t make her so ill! Couldn’t sell the children but made some loot! And Jack bought a second-hand suit!